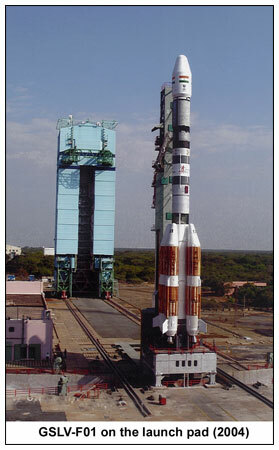 The first operational flight of India’s Geostationary Satellite Launch Vehicle (GSLV)—and its first successful mission—took place in September 2004 and delivered the EDUSAT/GSAT-3 payload into orbit (Credits: ISRO). After three difficult years, dogged by the bad luck of two back-to-back failures, India’s Geostationary Satellite Launch Vehicle (GSLV) was almost ready to fly today (Monday), but must wait a little longer. Liftoff of the “Demonstration-5,” or “D-5,” flight was scheduled for 4:50 p.m. India Standard Time (7:20 a.m. EDT), and the countdown and propellant loading appeared to be normal. However, according to the Indian Space Research Organisation (ISRO) in a post-scrub press release, a leak was observed in the UH25 fuel system of the rocket’s liquid-propelled second stage during the pre-launch pressurization process. This led to the long-awaited GSLV-D5 mission being officially scrubbed. A new launch date will be released in due course. ISRO has revealed sketchy details on its GSLV-D5 updates page. The 29-hour countdown began yesterday (Sunday) and encompassed the final loading of liquid propellants aboard the strap-on boosters and into the cryogenic second and third stages. These procedures were described by ISRO as “normal.” It would appear that the detection of the fuel leak appeared late in the countdown, about two hours before liftoff, after which standard post-scrub protocols were initiated, including the draining of unsymmetrical dimethyl hydrazine and nitrogen tetroxide from the liquid-fueled second stage, the four liquid-fueled strap-on boosters, and the Indian-built Indigenous Cryogenic Upper Stage (CUS). Although it was reported in the aftermath of the scrub that the GSLV-D5 launch window would be kept alive throughout its remaining period from 20 August through 5 September to allow for a rescheduled attempt, there has been no word from ISRO about how long the mission must now wait to fly. Certainly, the 161-foot-tall rocket will be removed from its launch pad at the Satish Dhawan Space Centre on the barrier island of Sriharikota, within India’s southern state of Andhra Pradesh, and transferred to the Vehicle Assembly Building (VAB), where inspections and repairs will be conducted. How long those repairs will take at present remains unclear. Standing 161 feet tall, the GSLV is a three-stage vehicle and is supplemented by four strap-on liquid-fuelled rocket boosters (Credits: ISRO). The last three years leading up to today’s scrubbed launch attempt have been troubled ones for the GSLV. Two of the rockets ignominiously failed within months of each other, in April and December 2010. Originally conceived as a means of eliminating India’s reliance upon foreign rockets—most notably Europe’s Ariane to deliver its geostationary-orbiting satellites—the three-stage GSLV utilizes components of the highly reliable Polar Satellite Launch Vehicle (PSLV), but has a dismal success record itself. Launched seven times between April 2001 and April 2010, it has suffered four outright Losses of Vehicle and Payload, one incident in which a satellite was delivered into an improper orbit, and just two full successes. Its maiden (“D1”) voyage in April 2001, flying in the Mark I(a) configuration, suffered an engine shortfall when its Russian-built upper stage burned for 12 seconds less than planned. This delivered the GSAT-1 payload into an orbit whose apogee was 2,500 miles lower than intended. Although ground controllers managed to nudge the satellite toward geostationary orbit, they did so at the expense of using all of its attitude control propellant, and GSAT-1’s tasks of digital audio broadcasting, compressed digital television signal transmission, and associated internet services could not be achieved. Success was finally achieved two years later, in May 2003, when a second Mark I(a) vehicle flew the “D2” mission and placed GSAT-2 into geostationary orbit. Perhaps a little prematurely, the GSLV was declared operational, and in September 2004 it carried the EDUSAT/GSAT-3 payload safely into orbit. However, success and failure went hand in hand, and in July 2006 the uprated Mark I(b) configuration veered outside permitted limits during ascent and had to be remotely destroyed over the Bay of Bengal by the range safety officer. Its primary payload—the Insat-4C multi-purpose satellite—was lost in the accident. Yet another Loss of Vehicle event occurred in September 2007, when a Mark I(b) suffered an underperformance of its third stage and failed to deliver Insat-4CR into geostationary orbit, due to a guidance system error. The satellite was eventually maneuvered into its proper orbit by ground controllers, but at the expense of reducing its operational lifetime from 10 to five years. 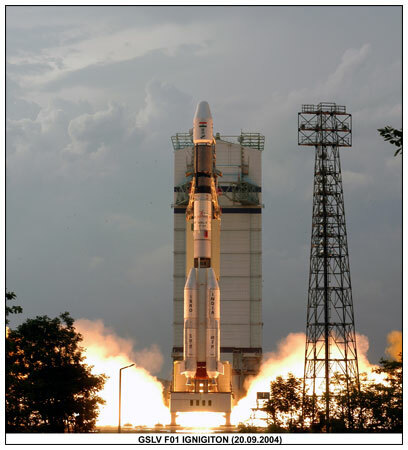 Two more failures followed: the first flight of the new Mark II vehicle (“D3”) in April 2010, with its ISRO-designed Indigenous Cryogenic Upper Stage (CUS), developed a turbopump fault and resulted in the loss of the GSAT-4 navigation satellite. This would have been India’s first spacecraft to utilize ion propulsion. Most recently, on the “D4” mission in December 2010, a Mark I(c) was lost when its four liquid-fueled boosters failed to respond to commands and the vehicle and GSAT-5P communications satellite had to be destroyed by the range safety officer. Late in 2011, S. Ramakrishnan, head of ISRO’s Liquid Propulsion Systems Centre (LPSC) at Mahendragiri, declared that the D3 turbopump fault had been isolated, corrective actions taken, and computer simulations concluded and validated. “We did a thorough analysis of the D3 flight and identified the reasons behind its failure,” explained P.S. Veerarghavan, director of Vikram Sarabhai Space Centre, quoted last year. “The analysis called for a redesign of certain components in the cryogenic propulsion system and the same has now been addressed and is being put through multiple testing.” Key focuses included high-altitude “hot-fire” tests to verify the performance of the third stage turbopump. Other recommended steps included strengthening the payload shroud. An image of Earth, acquired by India’s first lunar mission, Chandrayaan-1 (Credits: ISRO). In early May 2013, the Indian-built cryogenic third stage for Monday’s “D5” mission was transferred from LPSC Mahendragiri to Sriharikota for final checkout. On 5 July, the process of integrating the upper stage with the lower two stages of the GSLV got underway. Preparations for today’s launch, which shifted into high gear with the commencement of the 29-hour countdown yesterday and the loading of propellants, hinted that three years of bad luck were coming to a close. As it is, India will have to wait a little longer to see its vehicle fly. With a launch success record which currently stands at about 28 percent—two full mission successes in seven launch attempts—the GSLV has much to prove on the D5 flight. Its primary payload is the GSAT-14 communications satellite, which will replace the aging GSAT-3/EDUSAT, a mission launched in September 2004 to handle India’s demands for an interactive satellite-based education system. When fully operational in orbit, GSAT-14 will employ its six Ku-band and six C-band transponders to cover the entire Indian subcontinent, together with Ka-band beacons to study the impact of climate on the Ka-band satellite communications links in the region. Looking to the future, the GSLV is India’s vehicle of choice to loft its Chandrayaan-2 mission to the Moon in 2015, which includes a lunar orbiter, lander, and automated roving vehicle.